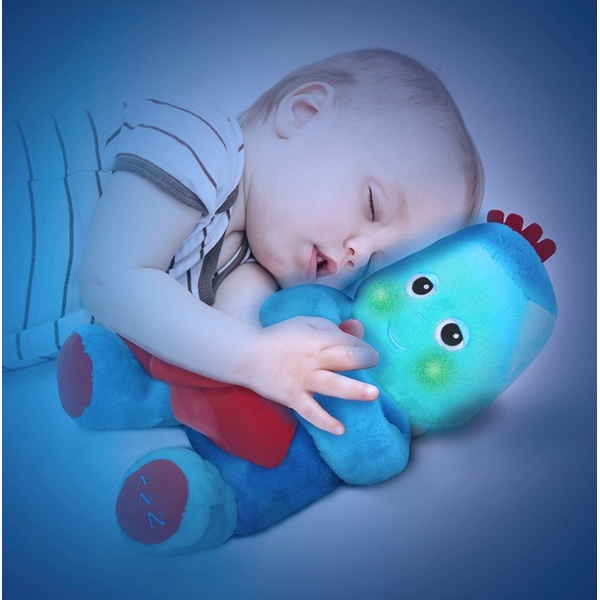 Made in soft to touch fabrics, Sleepy-time Igglepiggle has a cuddly, huggable body. Press Igglepiggle's left hand to hear his favourite lullabies. Whilst the lullabies play, his cheeks will glow softly and Igglepiggle will gently sway to the music. With the ALL NEW Sleepy-time Igglepiggle, bedtime will never be a problem! Based on the lead character from the much-loved CBeebies show, In the Night Garden, Igglepiggle is super-soft and cuddly and holds his iconic red blanket. Simply press Igglepiggle’s hand to activate his soft glowing cheeks and watch as his head gently sways from side to side as the soothing lullabies play. Suitable for children from 10 months.